For weeks now, the beginning of my morning routine has consisted of me waking up, turning off my alarm (and perhaps hitting snooze one-five times), finally turning the alarm off, and then studiously ignoring the notification that informs me each morning that my “iPhone storage is full-you can manage your storage in settings”. Today, however, my weeks long streak came to an end when, in my attempt to download the twitter app onto my phone for the first time since high school, I was met with the unfortunate truth that my phone did not have enough storage to download said app. So, after tediously reviewing and deleting large attachments and going through my pictures (and realizing that maybe it’s not quite necessary to keep all 4,000+ photos from abroad) for longer than I’d care to admit, I am successfully back on twitter and ready for this class. Well, “ready” may be an overstatement, but one step at a time. I have been thinking a lot about social media lately since apple released the new screen time feature in its update, which made me unable to deny looking in the face exactly how much time I waste browsing various social media apps. Sure, I follow news accounts on some and try and use it for a somewhat relevant purpose at times, but I am really looking forward to having a twitter account almost solely dedicated to learning about and keeping up to date on the technology that is becoming increasingly relevant in our world, in addition to using Instagram to send funny memes to my friends (which I have no intention of stopping, but it will be nice to supplement). So first impressions of Social Media and Digital Business. I arrived to the first class a little hungry, a little tired, and more than a little curious as to what I was getting myself into with this class. I chose it mostly based on the fact that I needed another elective to complete my entrepreneurship co-concentration requirements, the course description sounded interesting, and it fit with my schedule. I didn’t think too much about it again until I walked in for the first day, and at that time my mind was mostly focused on the realization of just how late a 7-9:30 class really is and cursing myself for not eating dinner before my arrival. Then Professor Kane got to the dreaded syllabus and rules part of the class, and I started internally cursing for a whole other set of reasons. Kidding, of course (sort of). I was, however, definitely thrown for a loop. Never in my life had I been in a class where the professor is open about it taking almost a month to “get it”, or about the workload being fairly significantly more than many other classes. Three weeks seems like a long time to get a class, but it does make me feel comforted to know I am certainly not the only one who will need a learning curve for this class (and probably not the only one who had to check the “First Week Deliverables” page approximately 57 times to make sure I was doing everything right). Despite my initial reservations, I am actually really excited for this class. As much as I’m sure I will be learning from Professor Kane, I am equally excited to have a forum, both in the classroom and all week long in our twitter and blogs activity, to learn from my classmates (who include those grown-up grad students). Some of the best classes I’ve taken at BC have been discussion based, and I can’t wait to see how learning from each other will play out in practice in this unique class set-up. And there’s no final, which I’m definitely not complaining about. 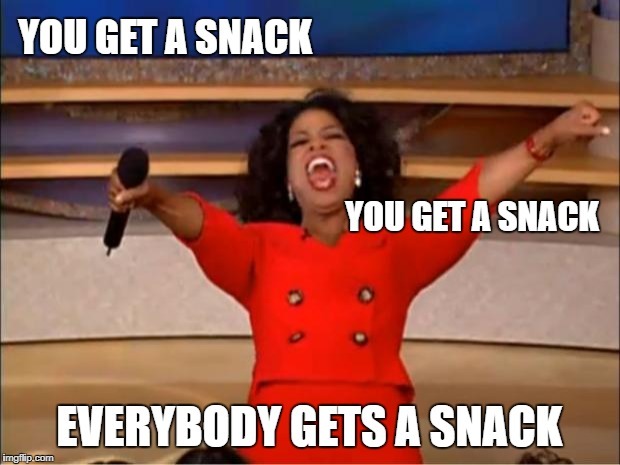 Also, there’s designated snack time, so how bad can it be?? I do the same thing with my “iPhone had not been backed up in two weeks” notification every day so I completely feel your pain. The irony of it in your case not letting you download twitter made me laugh. Love the new girl gif and can’t wait to learn through everyone in class discussions! You know, the funny thing is that the “three weeks” applies whether or not class meets or not. When we had “snowmageddon” 4 years ago, it was A MONTH between my first and second classes, but I had everyone keep blogging and tweeting. Everyone figured it out and it turned out to be a great semester! ← What should I expect? ?